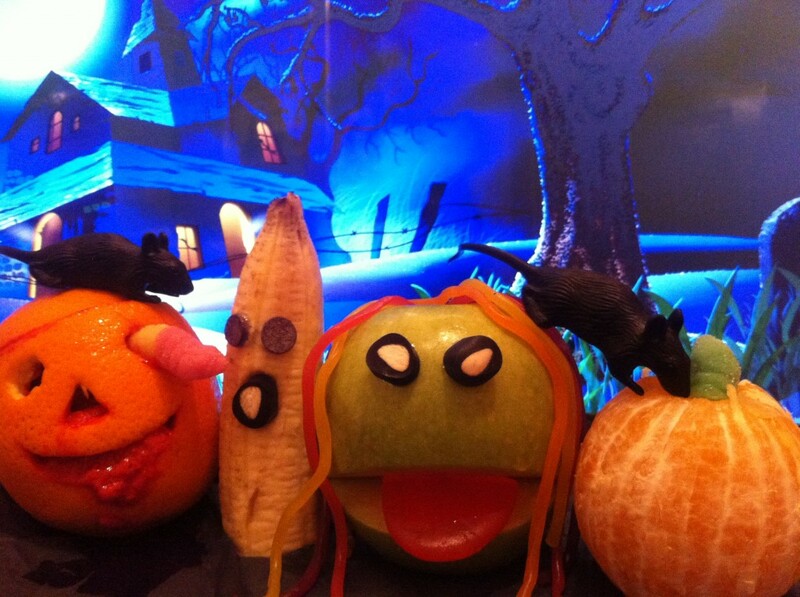 Meet Olly Orange, Betty Banana, Albert Apple & Ozzy Orange! You can probably tell Maxx and I love making, baking and crafting things. Today I saw a fantastic competition on alexandalexa.com that I knew Maxx would love to be a part of, the challenge was to create some spooky fruit! When I realised the competition was ending today I wasn’t sure if we would have enough time to do it but in the end I decided it was too fun an opportunity to miss so we set off to town to get some items we would need for our spooky fruit entry. The first fruit we made was the orange worm pumpkin which Maxx scooped, pulled and poked until it was hollowed out (very messy), I then carved the spooky face. We then made some angel delight and coloured it red (yum) then let the mixture set in the fridge. When the angel delight was set we scooped it into the hollowed out orange, placed a worm in the eye socket then put the lid on and placed it in the fridge until we were ready to create our scene. Making the Ghost Banana was the easiest part. Maxx was able to do most of this himself – he peeled the banana then pushed two chocolate drops into the banana, I cut a small bit of liquorice to create the mouth and Maxx squashed that on too! There you have it a Ghost Banana, very scary! Making the pumpkin on the right of the picture was the hardest part. Whilst attempting to make it I found out I am officially the worlds worst orange peeler, I ended up pulling chunks off of the orange! After the orange was peeled I cut a jelly worm in half and used the green half as the pumpkin stalk. I think it looks really good and it’s a fun Halloween themed snack. The apple was Maxx’s favourite to make as it involved some sweets! To make the spooky apple I cut a slice out of the apple to create the mouth then cut two small pieces of liquorice sweets to use as the eyes, I put a little bit of golden syrup onto the back of the eye and Maxx stuck them on. We then used a strawberry sweet as the tongue and some fruit laces for the hair. I think they all came out really well – very spooky right?! We both really enjoyed making and eating our spooky fruit scene it was well worth the rushing about, the sink full of dishes and the food colouring splashed everywhere ha ha! If you want to enter be very quick as the competition closes today at midnight! You can find out all you need to know on the Alex and Alexa competition page. Previous Post What's in your first aid kit?